This living room interior design is named “The Sky. The Sea. The Ships”. You must have guessed that nautical theme was selected for a reason. The thing is that this living room was re-designed for a true romantic, an ex-navy, whose hobby is ship modeling. But just by coincidence, the master wasn’t satisfied with pure nautical style that seemed most logical in this case. He wanted navy theme to be represented in small hints, like soft sough of sea waves or little breeze. Let’s see how the designer team managed to implement this idea! The first hint of sea theme is a wall painting that serves as an interior of a big open bookstand. It was decorated like a peculiar aquarium. And like in a true under-the-sea world, its water is varied and composed of multiple hues. 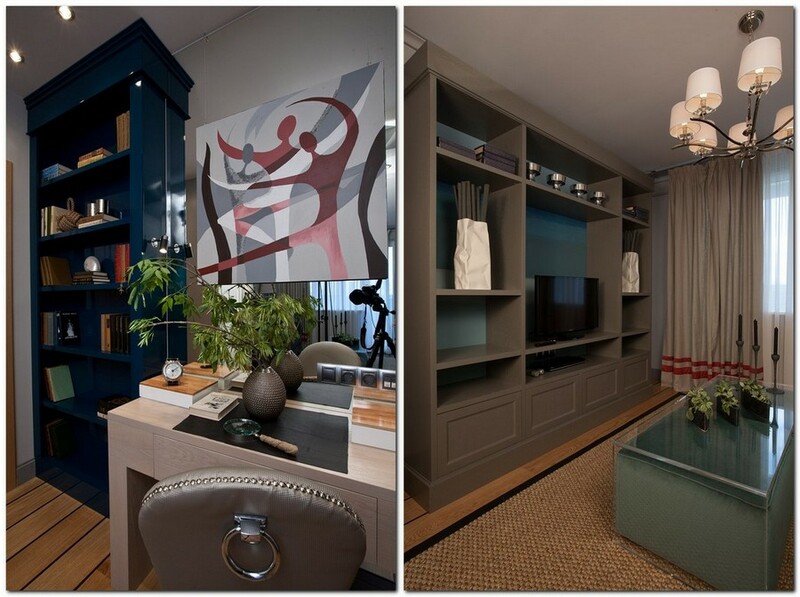 Darker bluish tints symbolize evening, night-time and storm, while lighter colors stand for sunny days and flat calm. 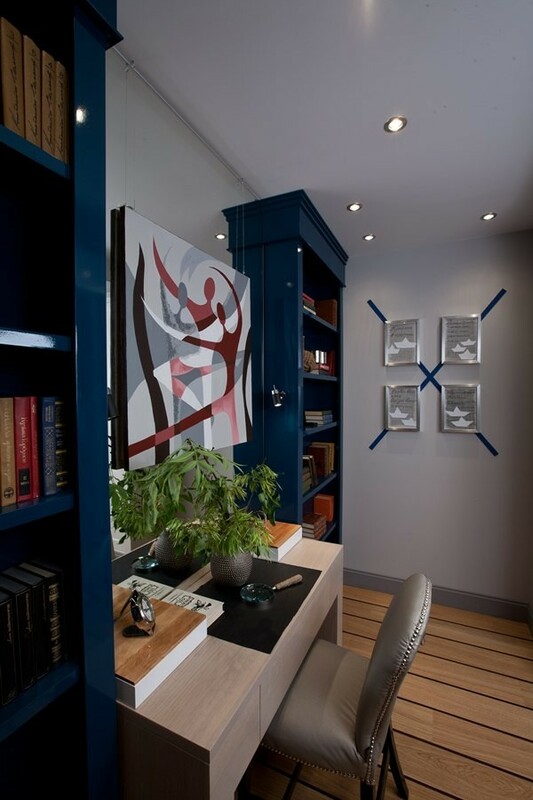 To create this painting the team used several hues of matte blue paint. If you want to decorate your home the same way, it’s pretty easy. At first you should outline the perimeter of the future painting with a painter’s tape, just to make sure that the lines won’t go beyond the bookstand. Then paint is applied with a roller. Don’t worry if the stripes appear to be uneven – this won’t spoil the idea a bit. And joints of different paint colors can be safely trimmed with a paintbrush. St. Andrew’s Cross is an X-shaped blue and white cross of saint apostle and martyr Andrew, who used to be a seaman before meeting Jesus Christ. Now it symbolizes his patronage to all people, whose jobs are connected with the sea. So, in the study zone of the living room this flag composes a piece of wall décor made of blue double-sided adhesive tapes. The flag reminds of the master’s past and the framed pictures above it refer to his nice present-time hobby – ship modeling. The artworks are arranged right opposite the bookstand. And if the latter refers to volatile and unpredictable state of the sea, the paintings depict the sky, which for sailors is just the continuation of the sea over the horizon. 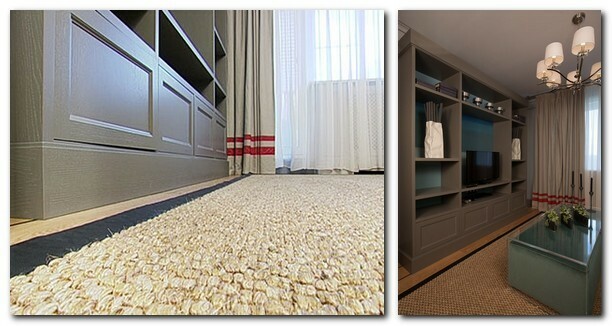 One more detail hinting at nautical theme is the flooring. Firstly, it’s made of teak wood, which is the most popular flooring material on ships. And secondly, the seams of light parquet boards are decorated with dark wood insertions, imitating resin used to embed the joints of deck floor boards. Sea fans will surely appreciate a sisal rug: initially this material was used for making deck ropes. And those who are too distant from nautical history will be interested in its natural origin and wear resistance. Besides the above-mentioned elements of the interior, nautical style is represented in small details arranged on the table and open shelves. For example, flower pots shaped as sea boats. On the whole the interior turned out to be very symbolic, and though it’s not pure nautical style, one can surely find its delicate hints. 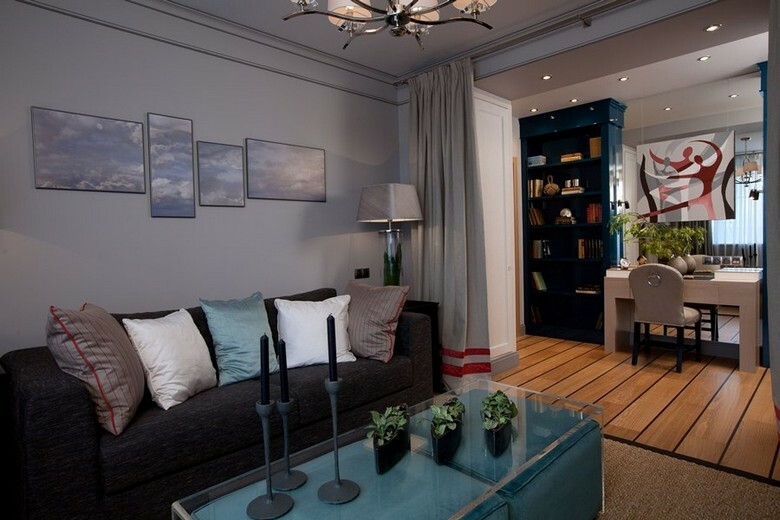 And in general, it’s a stylish living room with a work zone – contemporary, comfortable and homey.